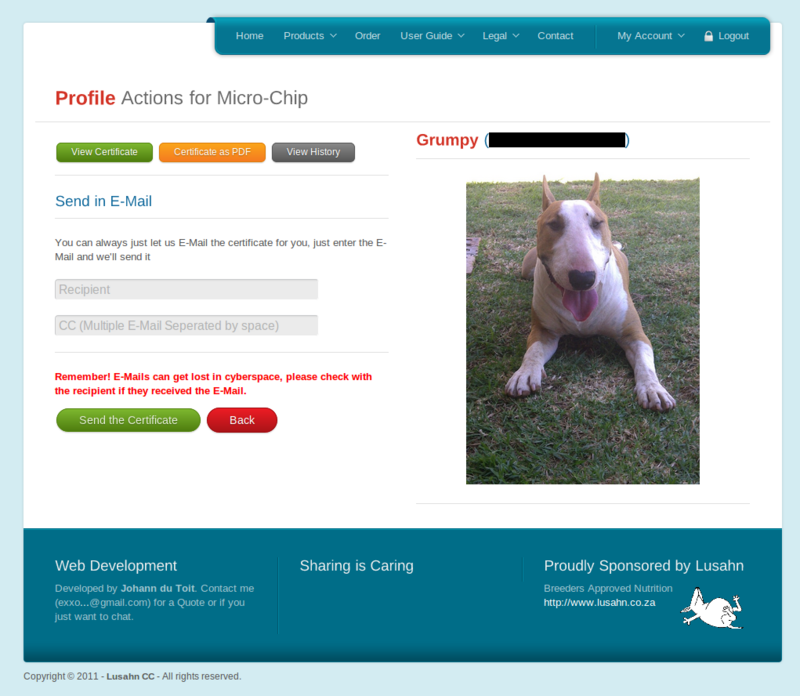 Microchip Management, manage your own microchip information and update it when you see fit. Personal Details Management (Your name, address, etc. ), changed address or telephone number? Just go online and change it, no need to waste time waiting for us to do it when you could have done it in 5 min. Transfer of Ownership, allow you to transfer ownership to of your micro-chip. 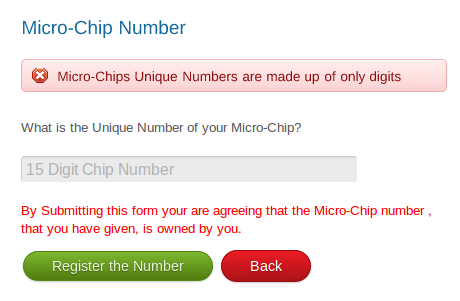 Great if you just bought the pet, simply give us the Microchip number. Then the other owner will either accept or ignore your request and if accepted you should have the pet linked to your account. Without typing any information about the PET! Generate Certificates in PDF format or let us just send the certificate for you to a E-Mail address of your choice. Detailed logging allows you to see precisely when you did what. Logging is tailored so any owner of a pet can see what happened to the pet in the past. Join us at http:///www.getmeknown.co.za and become a part of the family. To perform any account related action on Get Me Known (https://www.getmeknown.co.za/) you will need a account, and creating one is quite easy. To start head over to https://www.getmeknown.co.za/account/register and start the process. The E-Mail to where all the details/notifications of your account will be sent. This must be unique. The name of your Kennel (If any). Multiple users can use the Same Kennel Name, to let your spouse for example register with the name too. The address where we should mail any mail. The address where you live. To register a account you will need to accept our Terms and Conditions (https://www.getmeknown.co.za/legal#terms) and Privacy Statement (https://www.getmeknown.co.za/legal#privacy). Submitting the form is as easy as pressing enter or clicking "Register Me" button. After you have created a account you will need to Login (https://www.getmeknown.co.za/account/login), this is done by providig the E-Mail Address you used to register and the password for your account. 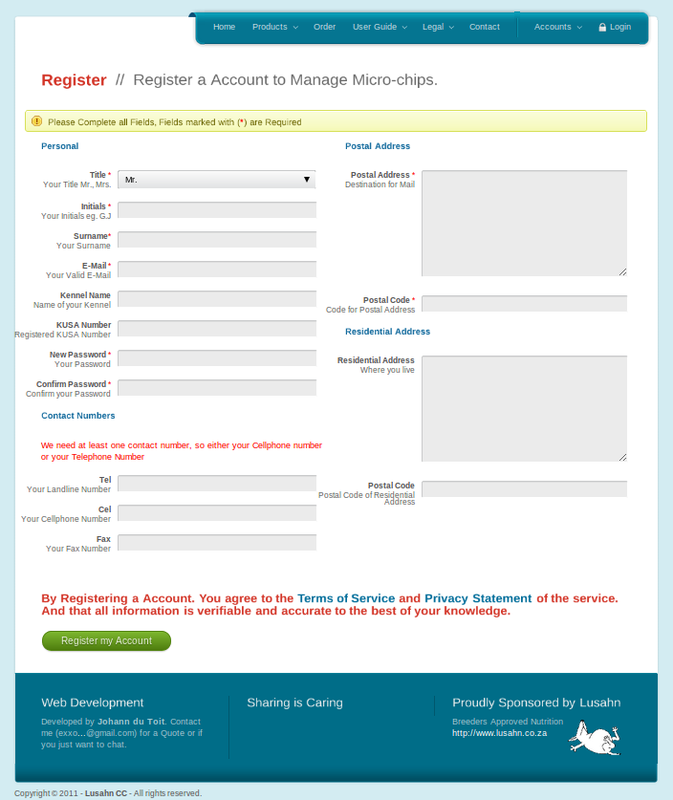 To create a Microchip click on "Register Microchip" and follow the directions on the next screen. You will then be asked to Provide your Microchip Number. It will then check if the Number exists and if it does ask if you want to rather perform a Transfer Request. A Microchip Numbers consists of 15 Digits. And if you provide a invalid number the system will tell you with a error message like the following. And if you provide a Microchip Number that has already been used, we will provide a link so you can perform a transfer if that was what you intented. 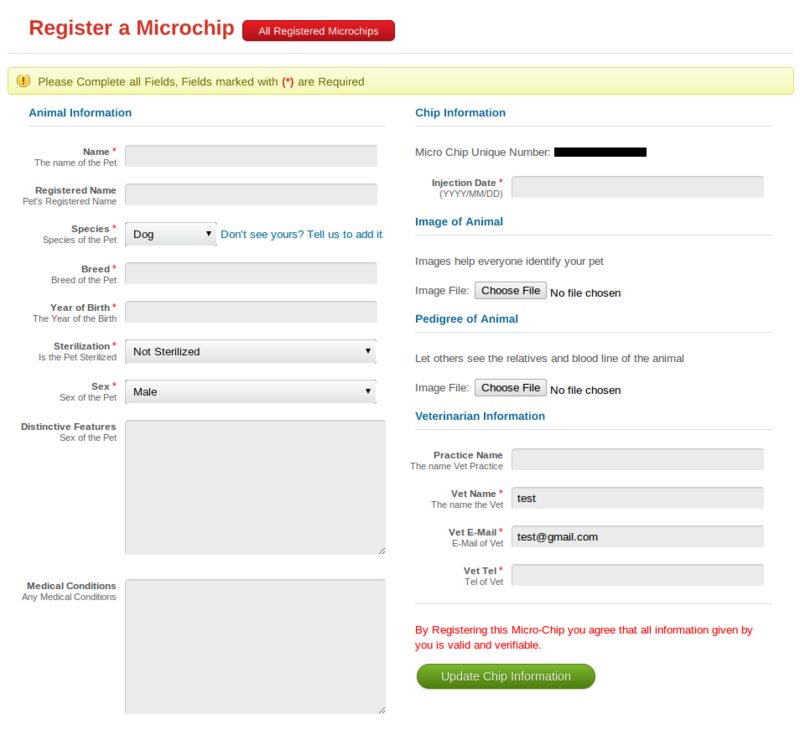 If the Microchip is not register you will be directed to a page where you can supply all the other information. Registered Name of the Pet (If Any), Registered Names are unique only one Pet can have this name at a time. Select the Species from the List we provide, if your Species is not in the list consider Contacting (https://www.getmeknown.co.za/contact) us so that we can consider adding it to the list. After you have completed all the required details you will then be taken to a page where you will be able to either view the Certificate online and send the Certificate in a E-Mail to someone. 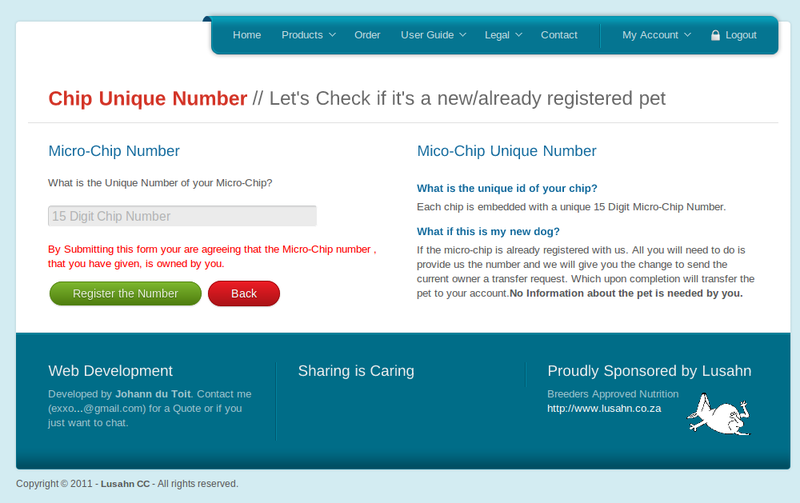 Your Microchip has now been registered and to add more simply repeat the process. Thanks for reading if you have anymore questions please contact us (https://www.getmeknown.co.za/contact). 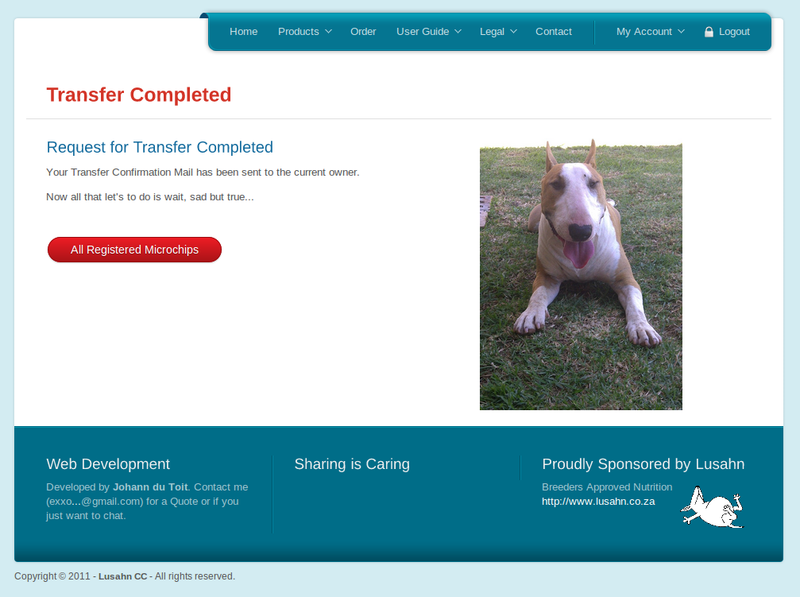 As a User of Get Me Known you can transfer ownership of a microchip to a new owner which is great if you just bought a puppy or received a pet for any other reason. To Start Login (https://www.getmeknown.co.za/account/login), or register (https://www.getmeknown.co.za/account/register) if you don't have a account. Then in the Main Menu on your profile page select "Transfer Request". 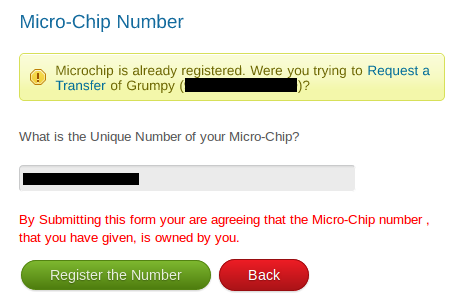 After you clicked the "Transfer Request" button you will presented by a page that asks for the 15 Digit Microchip Number of the Microchip you want to obtain ownership of. Here you will type the key and if correct you will be redirected to a page where you can review the details of the pet and then start the transfer request. 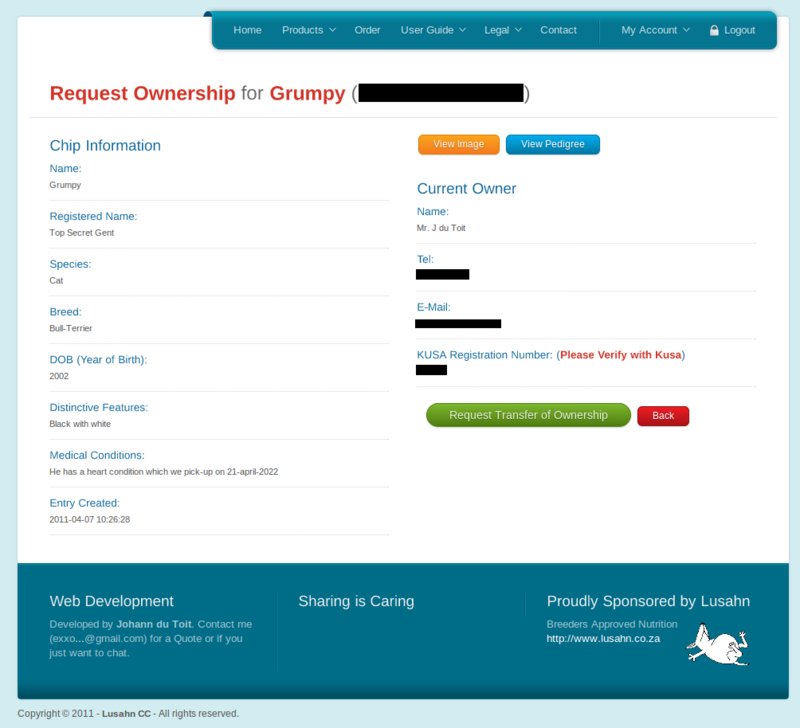 If the Chip is found you will be presented with the following page, where you can view information about the pet and see any (if the owner uploaded them) the image or pedigree of the pet. If you then proceed and click "Request a Transfer of Ownership" the request will be sent and you will be presented with a page that will tell you that the request has been sent and you just need to wait for the current owner to accept. Now you will need to wait for the Current owner of the Pet to Approve your Request. But in the meantime the pet will be listed on your Profile Page with a pending button. If you follow this button you will be able to resent the request if you so wish. But if it's been a long time consider contacting the owner and reminding them. 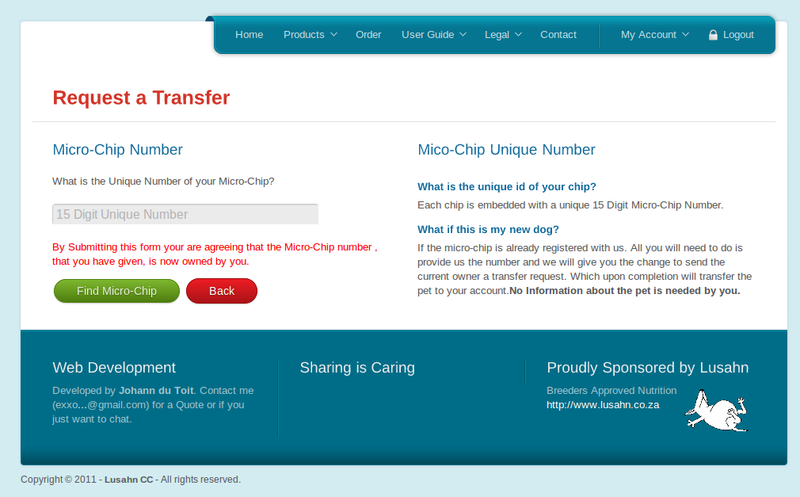 As a User of Get Me Known you can transfer ownership of a microchip to a new owner. 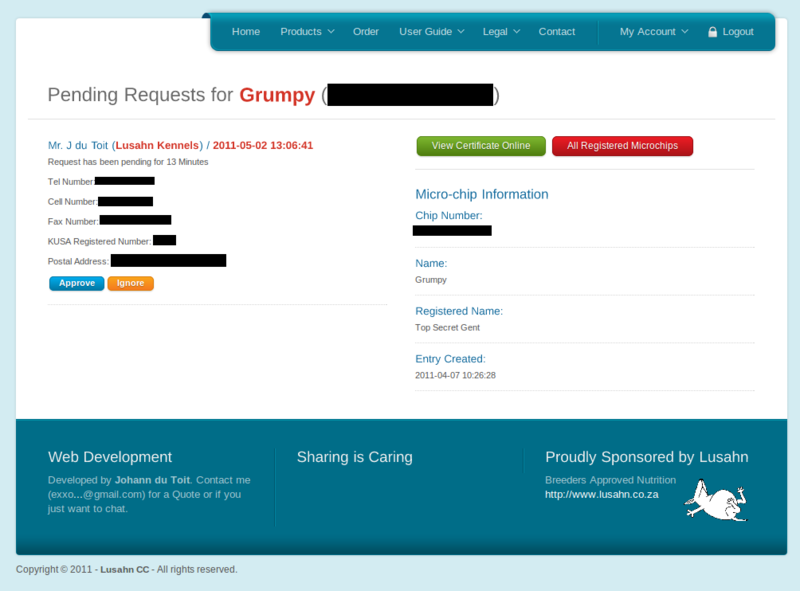 When someones requests a transfer of one of your microchips you will receive a E-mail from us telling you this and when you Login (https://www.getmeknown.co.za/account/login) you will see the request pending next to the record of the Pet. When you follow this link you will be presented with a page that will list all the transfer requests that are still pending. 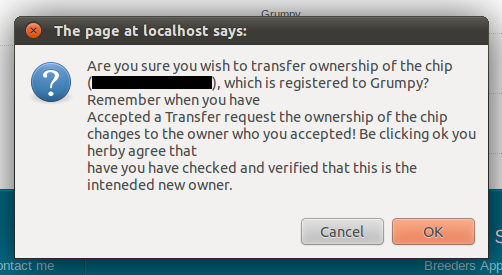 You can then approve or decline a request, Be Sure to check if the new owner you are approving is really your intented recipient as this cannot be reverted as you will need to request a transfer then from the new owner.. If you ignore a request it will simply be removed but if you approve a request a dialog will be shown that will ask you if you are sure. After you Confirmed that it is indeed the intended owner; the pet will not be shown as a registered microchip to your account and the new owner will be able to edit,manage and print details just like you did. 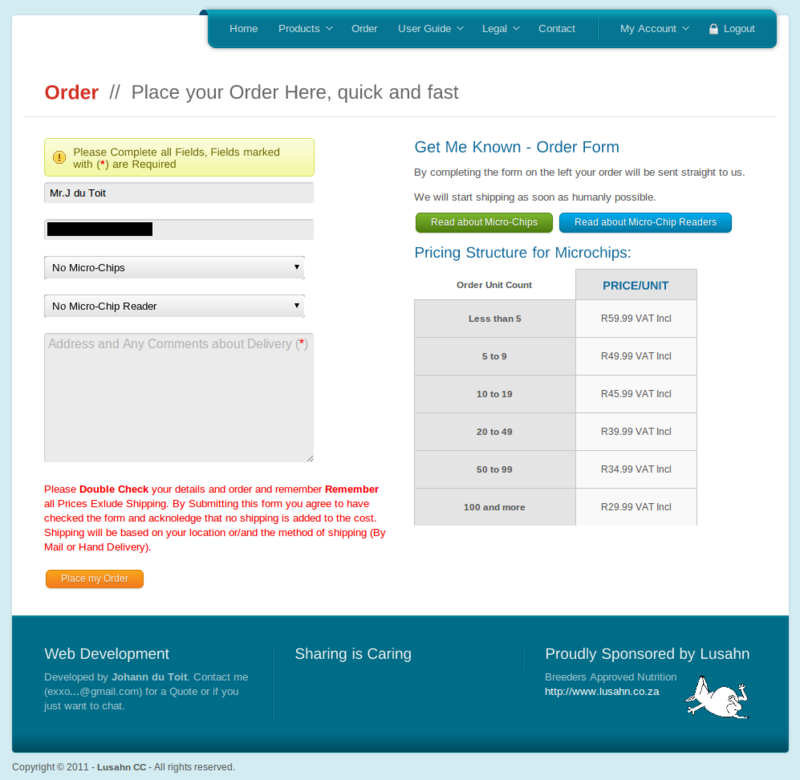 You can easily order some of our Microchips (https://www.getmeknown.co.za/product/microchips) or Readers (https://www.getmeknown.co.za/product/readers) by going to the order page (https://www.getmeknown.co.za/product/order). Your Name; This will be how we address you. We Require a Valid Telephone Number to contact you by. a Valid E-Mail which by we can contact you. Your address and some comments of things we need to know about. When you have placed your order you will be E-Mailed a Confirmation Mail and we will start processing your oder on the next working day. Copyright © 2019 - GETMEKNOWN (Pty) Ltd 2015/436/468/07 / PO Box 1081 Malmesbury 7299 / Fax 088 022 485 7310 - All rights reserved.